You can always tell a Milford man -- or woman, as the case may be. You see, I believe that paperwork should neither be seen nor heard, just like the attendees of the Milford Academy (such as illustrious alum Buster Bluth). Now, you may be asking, "Why would you hear your paperwork?" And I would say, "Maybe it was a Howler sent by owl, duh. Now go away and stop forcing me to make two dorky in-jokes right after each other." The point is, paper clutter is one of those things that can quickly make you look as crazy as someone who cuts things out of the newspaper and constantly works on their "manifesto." In a small apartment, it can pile up faster than you can file it. However, you can get your mess under control -- or at least fake it -- with the help of a classic piece of furniture: the secretary desk. Or in our case, a stripped-down version. 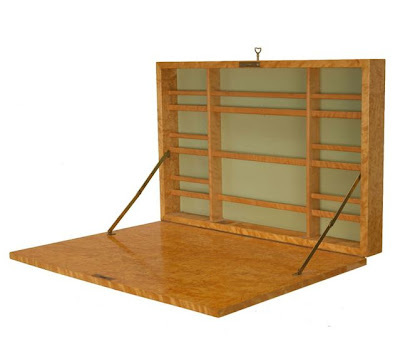 Traditional secretary desks are freestanding pieces of furniture that often have drawers on the bottom, a cabinet with a fold-out writing surface, and a bookshelf on top of that. However, if you take away everything but the cabinet, you've got a piece that's ideal for a small space. 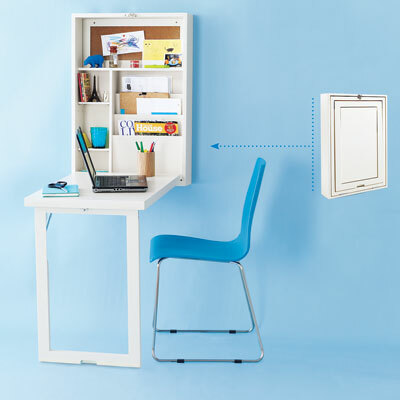 In removing the legs and mounting it on the wall, you free up floor space, and having a cabinet with a fold-down door allows you to create workspace when you need it, to put it away when you don't, and to hide all of your things away neatly. 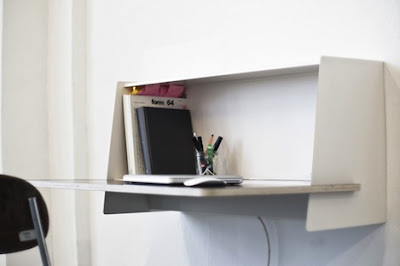 Below, take a look at ten of the coolest wall-mounted folding desks I've spotted. A red IKEA PS laptop workstation, as seen on Bright Bazaar. 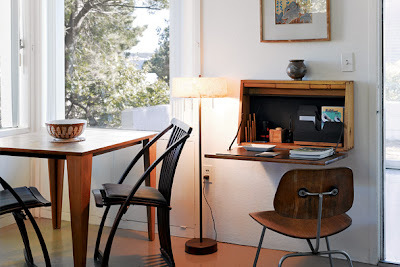 This gorgeous antique was designed and built by Bruno and Karl Mathsson in 1938. Via Design Addict. 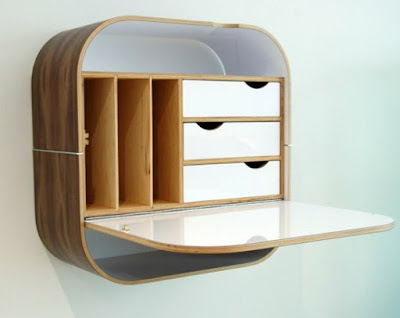 I've had this wall-mounted desk and mail sorting cabinet on my Pinterest for ages; unfortunately it looks like it's no longer for sale on Etsy, where it was originally found. 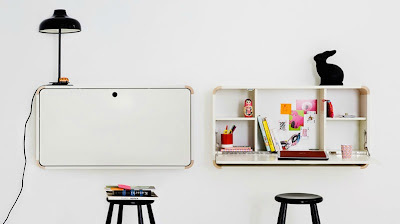 This cute white desk and organizer isn't just for kids, despite the fact that it's for sale on Junior Living. Via Spearmint Baby. 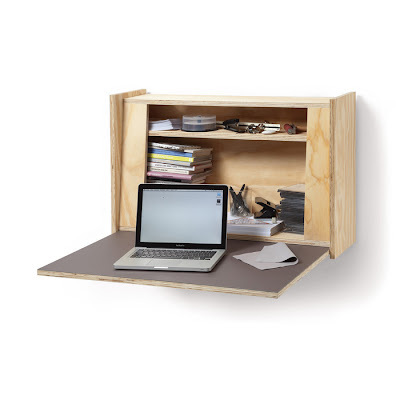 This fold-out desk from Magazin (a German retailer) has a ton of possibilities for painting and decorating to make it fit your own style. 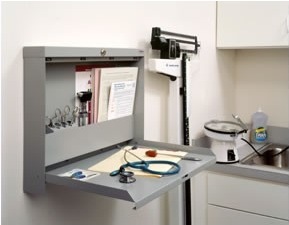 If you want to go for industrial chic or just added security, check out this metal, locking desk originally designed for workplaces and doctors' offices. From Marine Lock. The SpaceBox by Calligaris is originally intended for use in small kitchens or dining areas, but it provides ample storage no matter where you use it. Via Momoge. This sleek and simple wall desk from Bastian Diephaus and Ismail Özalbayrak of Studio Unieke has a built-in power strip for added convenience. Via Shoebox Dwelling. 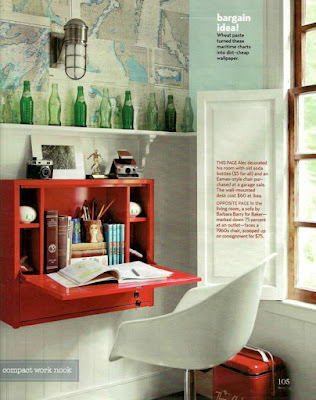 This fold-down desk, originally from World Market, calls to mind a Murphy bed. Via This Old House. On the inside of one of the cottages of Wellfleet at Cape Cod is another beautiful example of a practical but stylish desk. From The New York Times Style Magazine. Huge fan of these or anything that gets work out of sight out of mind. Could be kinda fun to do something to the bottoms of these so when they are closed they become a little art project! Now that's space saving at work. Looks like another design to put to use back at home (now where are those hand drills and saws we kept at home...). Unique and Stylish Design. 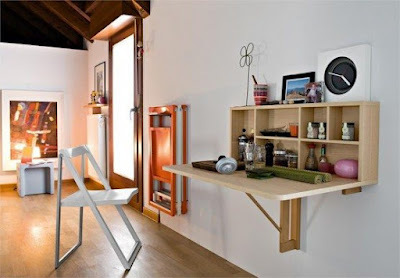 It is really very helpful to decrease space..